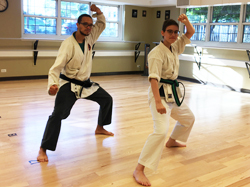 Develop mental discipline, coordination, flexibility, strength and self-defense skills in The Connection’s karate and martial arts classes! 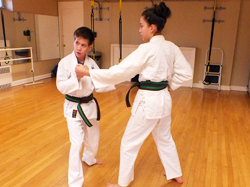 We have classes for all ages and levels…from beginner youth classes starting at age 4 through adult. The Connection has something for everyone. Karate classes are led by Chris Goedecke, author, and 8th degree black belt, with 48 years of experience, and his team. A pre-karate class focusing on concentration, flexibility, agility, balance and fun! 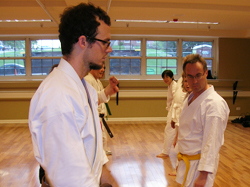 Progressive classes are offered for three different skills levels; Beginners (white belt), Intermediate (yellow/orange belt) and Intermediate/Advanced (blue belt–Junior black belt). Strengthen your body and your mind with classes in Okinawan karate for both beginners and intermediate level. Taught by black belt, Brian Vivas. Adults, unite your mind, body and spirit through productive and healthy self-expression.